At the retirement celebration for Professor Marjorie Kagawa Singer. 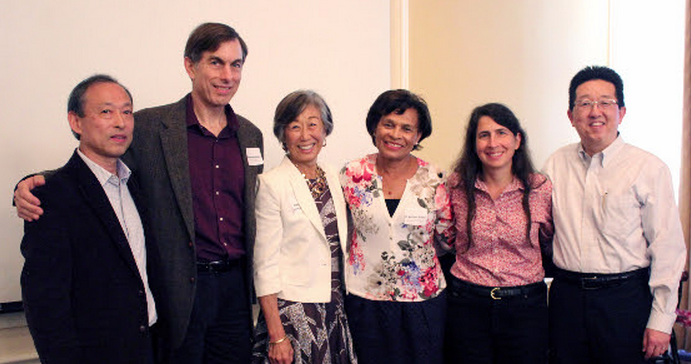 From left: Asian American Studies Department Chair Jinqi Ling, Department of Community Health Services Chair Steven Wallace, Professor Marjorie Kagawa Singer, Vice Provost of the Institute of American Cultures M. Belinda Tucker, Fielding School of Public Health Dean Jody Heymann, and Asian American Studies Center Director David K. Yoo. 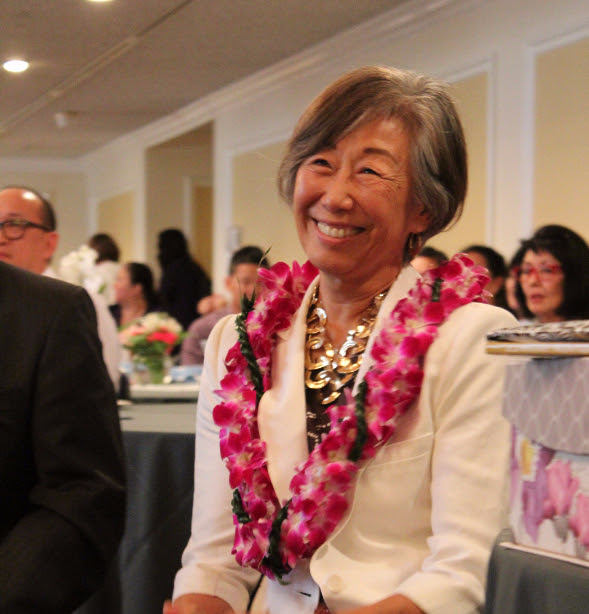 The UCLA Asian American Studies Center announced on June 2 the retirement of Professor Marjorie Kagawa Singer, after a 21-year career of research and teaching Asian American, Native Hawaiian, and Pacific Island (AANHPI) studies and public health at UCLA, effective in July. Yoo also announced that Kagawa Singer and her husband, Dr. Peter Singer, have established the George and Lily Kagawa Award for Asian American and Pacific Islander Health Research in honor of Kagawa Singer’s parents. The award will support UCLA undergraduate and graduate student research partnerships with community-based organizations in health-related areas. “Given Professor Kagawa Singer’s tireless work to bridge campus and community, this award is a wonderful tribute not only to her parents’ legacy, but also to her own longtime efforts to improve the lives of others,” Yoo stated. Kagawa Singer has a master’s degree in nursing from the UCLA School of Nursing, as well as a master’s degree and Ph.D. in anthropology from UCLA. She served as director of the Concurrent Degree between Community Health Sciences and Asian American Studies, where she nurtured generations of students who have become academic, professional and community leaders. Kagawa Singer served as the principal investigator for Minority Training Program for Cancer Control, associate director of the UCLA Lance Armstrong Center of Excellence for Cancer Survivorship, and co-principal investigator of the Asian American Network for Cancer Awareness, Research & Training (AANCART) Initiative. AANCART is the first-ever national cancer prevention and control research initiative specifically targeting Asian Americans funded by the National Cancer Institute. Its mission is to reduce cancer health disparities by conducting community-based participatory education, training, and research by, for, and with Asian Americans. Kagawa Singer also served as the senior editor for the center’s AAPI Nexus Journal from 2007-2012. Under her leadership and dedication, the journal partnered with the White House Initiative on Asian Americans and Pacific Islanders to produce a special issue, “Forging the Future,” which is arguably the most comprehensive publication to date on AAANHPI demographic data trends and federal policy — including policy briefs on civil rights, economic development, education, health, and Native Hawaiians and Pacific Islanders by over 50 leading AANHPI scholars, applied researchers, and community leaders from all over the U.S.